Remember Scott Proctor? 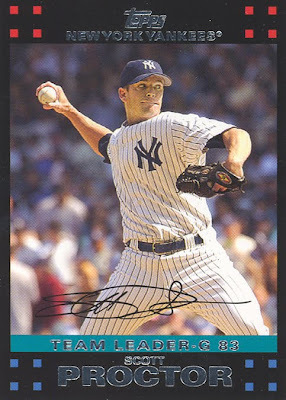 As noted by this card, he led the Yankees and the league in appearances in 2007. He even has a Yankees blog named after him. The latest news on Proctor came yesterday from MLB.com. Recovering from Tommy John surgery last year, he is aiming to be ready by Opening Day. But manager Bobby Cox isn’t guaranteeing him a spot on the 25-man roster. "I can't make that call," Proctor said Saturday. "You have to go talk to the boss. I control what I can control, and that is not one of the things that's under my control. What I do is go out each and every day, [work hard] and make the decision very, very tough for them. But in the end, it is their decision, and I respect them for that. Wherever they put me, it's where they put me." Good for him. It’s always fun to follow the Proctor. By the way, next week's featured card will mark the start of a new series of cards. Get excited.